So different from traditional Buffalo Chicken Wings and I think SO much better too. These Sweet, Spicy and Sticky Chicken Wings made in a slow Cooker are absolutely addictive. As I peruse old posts deciding which ones warrant a redo, I occasionally find a gem that I can’t believe has languished in the dark ages for so long. 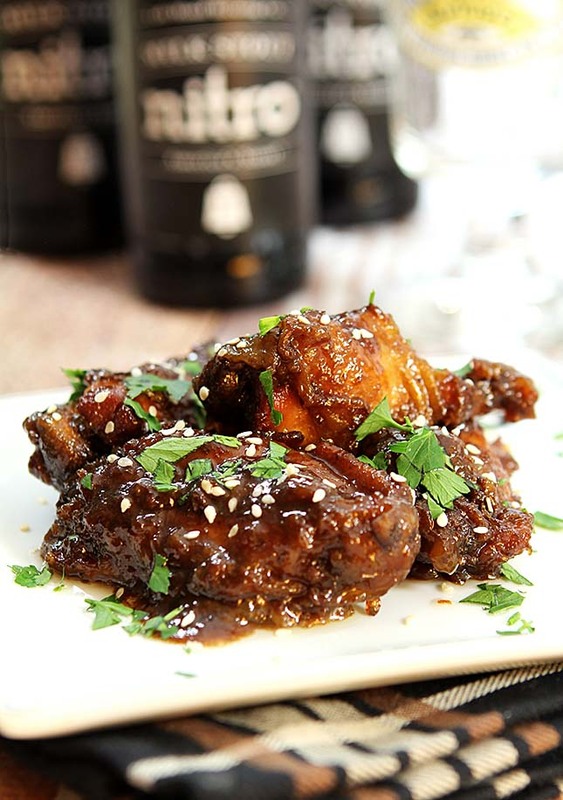 I first posted about these Sweet, Spicy and Sticky Chicken Wings almost a decade ago…how could that be? When football season hits, they are a party favorite but I just could not in all good conscience promote them with an awful photo. Plus I love being reminded of things I LOVE and know many readers in that 10 year interim would love them too. I’ve been making these pups for over 20 years and still love them as a great alternative to Buffalo Wings. These are so not your standard wings. While I enjoy hot wings with a cool garnish, I actually love these more. They have a sticky, spicy, and sweet coating made from red wine and brown sugar, the spicy comes from garlic and mustard and the sticky? Low and slow cooking melds those flavors into a wonderful sticky coating; you’ll know since they are eaten with your fingers! Trust me, they will disappear quick. The original recipe for these chicken wings has them slow cooked in the oven or if made during the summer I’ve even managed them on the grill. But honestly they were a bit of a pain. Constantly watching and turning to insure that all of the wings cooked equally make them more work than I ever wanted but I suffered for the results and after this latest effort found that I don’t have to! I’m excited that making Sweet, Spicy and Sticky Chicken Wings is so much easier in a slow cooker and yet the results are just as wonderful. Like many, I’ve come to re-appreciate my slow cooker. The ones from ‘the olden days’ that might have promised to make cooking easier were also so limiting. One temperature setting meant some careful monitoring. New units include so many settings that they work better to fit with our schedules. As I contemplated changing a low and slow bake period in the oven to replicating the same results in my slow cooker, I was happy to have a counter-top unit with a Low temperature setting…I wanted wings when I was finished, not a stew of sweet and sticky chicken meat! Results were fantastic but this does require a step outside of the cooker but it’s SO worth it. Baking the wings in the oven does see the sauce evaporate more quickly and while I’m sure a longer period in the slow cooker might have seen that happen I didn’t want to risk overdoing the wings. It’s a simple enough step and even with that bit of cooking outside of the slow cooker the process is so much easier than what I’ve done in years past so no complaining from me. Combine all sauce ingredients and pour over chicken. Let stand for at least 1 hour. Be sure all wings are well coated with marinade. Set cooker to cook for 3-4 hours on low; Meat should be tender but the wings should not be falling apart. Pour off sauce and skim fat. Reduce sauce in a pan on the stovetop until thickened. Return to pot with chicken and serve. Place wings in large baking pan and cover with sauce. Put pan in 350 oven and reduce heat to 250. Bake 4-5 hours (check hourly), turning wings at regular intervals. If all marinade is not absorbed, pour off and reduce in a pan on the stovetop; add back to wings before serving. « Wood Butter – A Recipe for Your Utensils! I prepared these tonight they didn’t come out looking like the ones shown. I had to put them under the broiler to add color and make them crispy. My kids said they still tasted good. 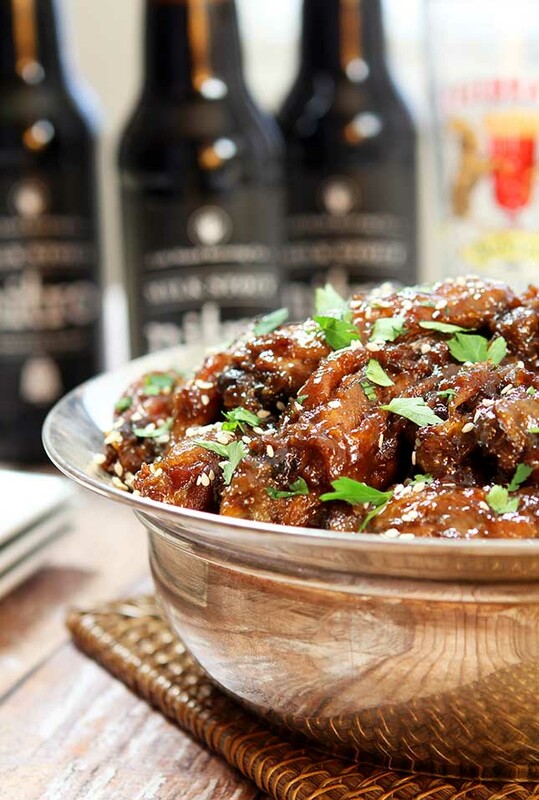 They are not crispy Charleen; the sauce is thick, sticky and rich colored from the combination of red wine and brown sugar. I do wonder what happened but if the kids liked them…then that’s good! Your sauce sounds wonderful. I would have never thought to make chicken wings in a slow cooker but it really does make a lot of sense to do so. I don’t use my slow cooker nearly enough. And this recipe is perfect for it! Set and forget, with just a bit of stovetop time at the end. Works for me — particularly for a dish that looks this good! Thanks. Oh I can’t wait to try this one. 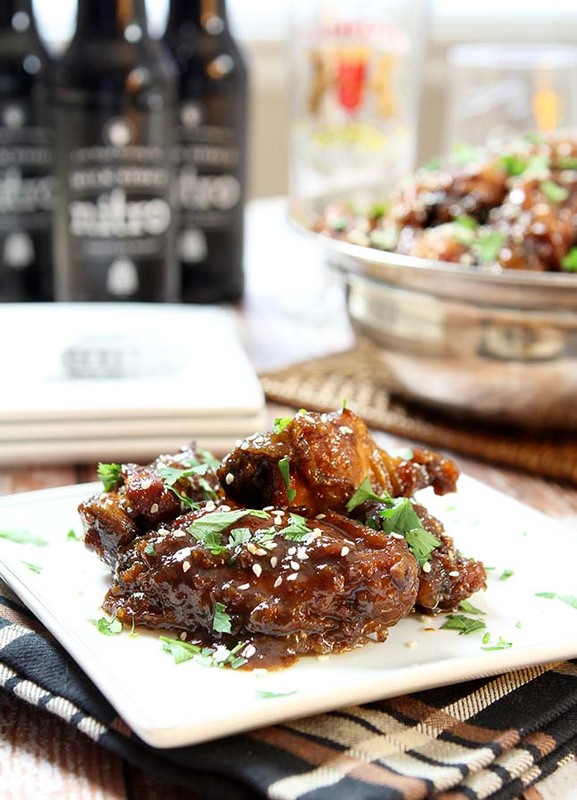 I adore sticky wings and love getting as much use out of my slow cooker as possible. Thanks for sharing, Barb. Trust me (I know you do! ), these are simply divine. Nothing close at all to regular ‘Buffalo’ hot wings and I’m so good with that!